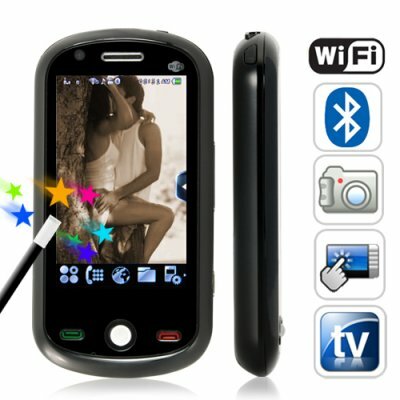 Successfully Added Ultra Touch - 3 Inch Touchscreen Dual SIM WiFi Media Cellphone to your Shopping Cart. This brilliantly and beautifully designed 3 inch touchscreen cell phone with WiFi, TV, FM radio, dual SIM, side gadgets bar, scroll-ball, dual camera and Bluetooth gives you far greater performance for the value than an iPhone, Blackberry, Motorola, Nokia, Samsung and the likes. The Ultra Touch unlocked quadband multimedia wifi cellphone with a 3 inch smooth touchscreen comes with a drag-able menu and designed with a magnitude of functions and features, that lets each user personalize their new 3 inch touch screen mobile phone with dual SIM & dual standby to suite their needs from social to business use & everything in between. This 3" touch screen dual SIM WiFi multimedia mobile phone comes with a 3.5mm audio out, mini USB input, loud speakers, a scroll ball for menu navigation, volume control that can be used for menu navigation as well and dual cameras. Internally, this quad band unlocked wifi cellphone offers a world of its own. The infrastructure is designed to cater effortlessly to usability as well as providing great performance with exceptional time efficiency for faster accessibility to the functions and features. What else could anyone want from a quadband unlocked 3 inch touchscreen cellphone with wifi, TV, FM radio, Gadgets bar, super user friendly menu system, dual SIM & standby support, audio player, video player, sound recorder, FM record, TV record, Image viewer and motion sensor control that is all supplied with 2 rechargeable li-ion batteries, and housed in a hard ABS plastic cover with aluminum. The magnificent Ultra Touch 3 inch touchscreen dual SIM WiFi multimedia mobile phone is in stock now! Hurray!!! Hurry and click "Add to Cart" now and let us ship you a sample so you can start believing in magic. The Ultra Touch 3 Inch Touchscreen Dual SIM WiFi Multimedia Cellphone with TV, FM radio, scroll ball, Bluetooth and motion sensor is brought to you by the supreme leaders in factory direct wholesale electronics, Chinavasion. ;-). P.S: As they say! A picture paints a thousand words, take a look below, and enjoy! *How can I install a Java application on this phone? Search the internet for Java files that have the extension .jar (these are executable Java files). Not all of them will work. Some are especially for Nokia or other brand phones. Transfer it to your phone's micro SD card as you would normally transfer a file. From the FILE icon, locate your file and select it. Java will take over and ask you if you want to install it. Agree and the application will be installed for you. Enjoy! Does the M104 come with an analog TV tuner? Yes, watch TV and be happy with the Ultra Touch wifi phone. No, this phone is better than the iPhone! Unlike the iPhone, the M104 comes fully unlocked and ready for use with any network or carrier straight out of the box. You do not need to use any firmware hacks and risk "bricking" the phone. The M104 also has dual SIM and video recording functionality (unlike the iPhone). Is this phone like the Chinese HiPhone, APhone, or SciPhone? No, this is better than all of them. Unlike with other Chinese touchscreen phones, the M104 comes with a full 12-month warranty from Chinavasion along with a professional in-house customer support service. You can also be secure in the knowledge that your M104 has gone through rigorous QC testing before it is shipped direct to you.